CESAR was present on the ESA Space Science Workshop SSW#10, held 13-15 Nov 2017 in Aranjuez. 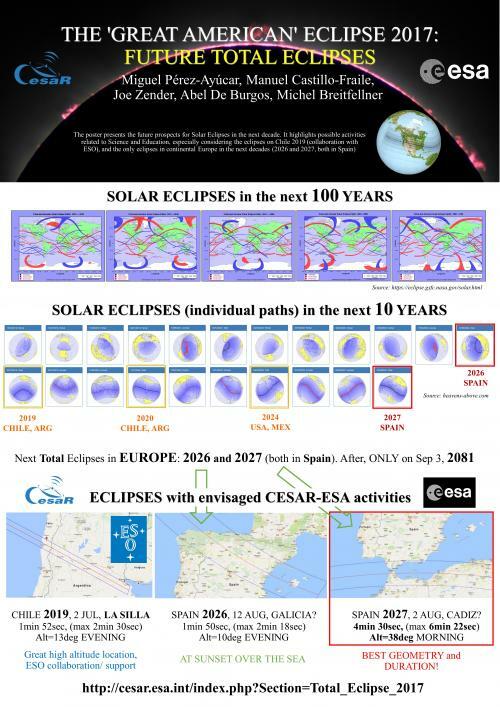 CESAR displayed a series of 5 posters, plus one more in collaboration with Proba-3 team. 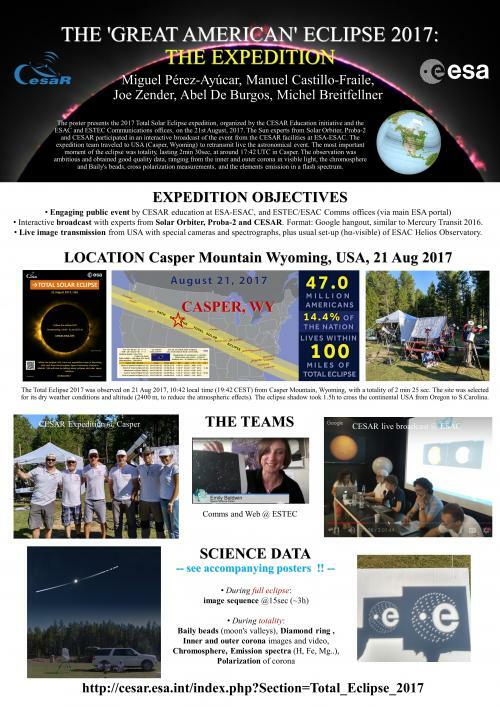 The posters described the activities carried out during the USA Total Solar Eclipse 2017, Casper, August 21 related to science and education. 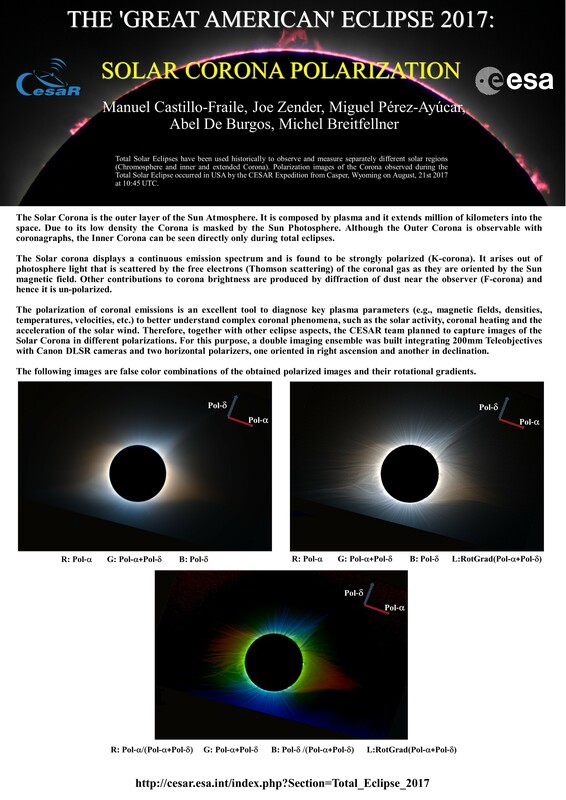 The work was possible thanks to the CESAR initiative, in collaboration with the ESAC/ESTEC Comms offices, and the ESAC solar projects Solar Orbiter and Proba-3. Prospects for next eclipses will involve the European Southern Observatory (ESO) during the total eclipse on 2 July 2019 at La Silla, Chile. 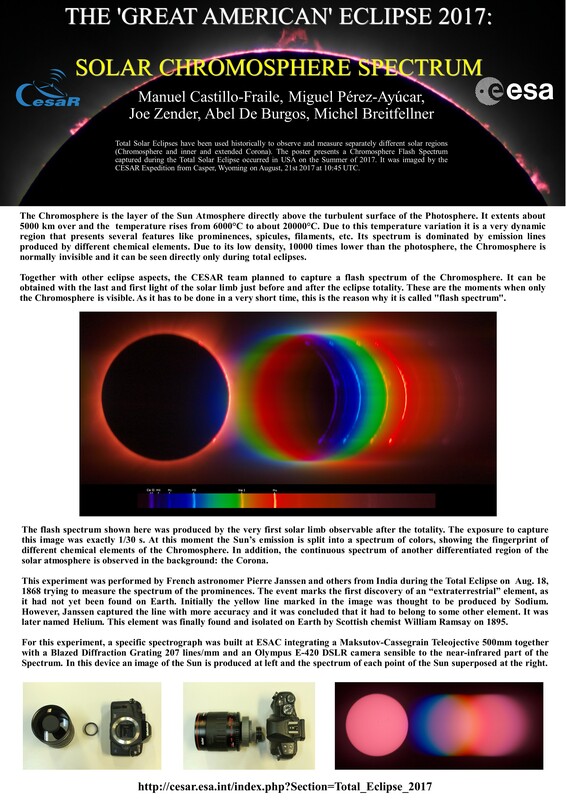 CESAR has already collaborated with ESO during the Mercury Transit 2016. Abstract: Total Solar Eclipses have been used historically to observe and measure solar regions like its Chromosphere and inner and extended Corona, not visible with scientific equipment due to its low emission compared to the overwhelming photosphere. Despite modern ground and space instrumentation advances, the inner corona is still accessible only during eclipses, and therefore important scientific campaigns are scheduled during these astronomical events. Proba-3 will be the first spacecraft to overcome this, and be able to measure this very important region of the Sun's atmosphere. It will be ESA’s – and the world’s – first precision formation flying mission, with a pair of satellites in precise flying formation. 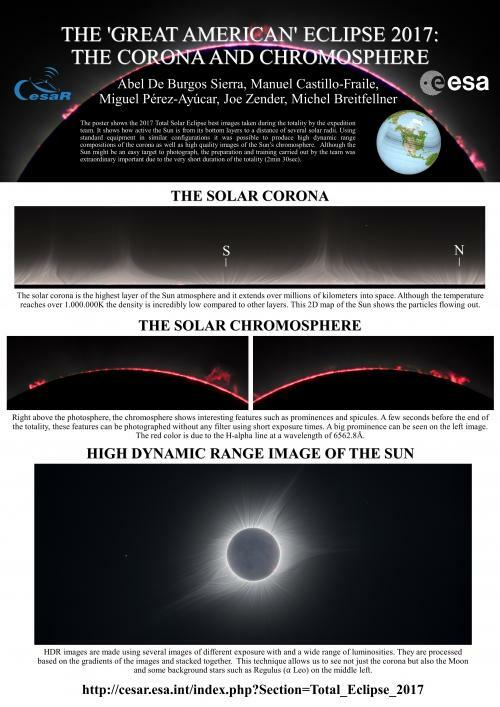 The paired satellites will create continuous artificial eclipses, forming a 150-m long solar coronagraph to study the Sun’s faint corona closer to the solar rim than has ever before been achieved.